Tokyo, July 25, 2014 - Fuji Heavy Industries Ltd. (FHI), the maker of Subaru automobiles, today announced that Subaru's all-new sports sedan, to be introduced in Japan on August 25, has been named "WRX S4". While the "WRX S4" has "the Subaru's top AWD (All-Wheel drive) sports performance", the sports sedan also achieves "unique overall safety performance" with features such as the next-generation EyeSight, "superior environmental friendliness" and "high-quality feel". By fusing these four values at a high level centering on its AWD sports performance as a core attribute, a new value has been achieved. It enables more drivers to enjoy superb driving performance with safety and comfort. 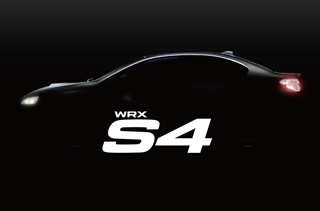 To represent the above four attributes, the vehicle name "S4" has four meanings; "Sports performance", "Safety performance", "Smart driving" and "Sophisticated feel". A special website has been launched on the Subaru Official Website at 11:00 am on July 25 (Japan time) to release teaser images and other information.